TBags Los Angeles offers a variety of women’s and girl’s clothing and accessories, with styles that are worn by some of Hollywood’s top celebrities. Their designs embrace a vintage, bohemian style and are especially perfect for warm summer weather. With Big Apple Buddy’s personal shopping service, you can now buy direct from the TBags Los Angeles online store anytime, anywhere. The TBags Solange Dress is an option that you can easily wear from day to night, and can be worn at anytime throughout the year. Make it fancy by throwing on a pair of heels, or keep it casual with some sandals for a trip to the beach. Hit the beach and embrace your colorful side in this Ishtar Bikini, which is a new addition to the brand’s Summer 2015 collection. The bold print will help you stand out on the beach, and the quick-dry material will keep you comfortable both in and out of the water. TBags Los Angeles offers some options for your little one as well. 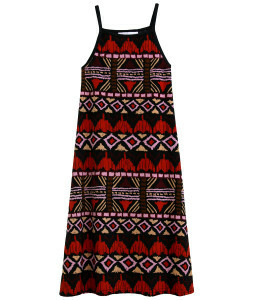 She’ll love this Midi Misa Dress, with its eye-catching tribal pattern and easy tank strap design. It’s perfect as a beach cover-up or for a day out in the sun! Unfortunately, the USA TBags Los Angeles online store does not currently offer international shipping. However, Big Apple Buddy, your personal shopper, can help you buy products direct from the official USA TBags Los Angeles online store and ship them to your doorstep, no matter where you are in the world. We offer international shipping to over 220 countries including Australia, South Africa, France, Germany, Thailand, Italy, the UK, New Zealand, Spain, the Netherlands, Switzerland, Malta, Brunei, Indonesia, Norway, Malaysia, Denmark, Finland, Philippines, New Zealand, Portugal, Peru, Mexico, Slovenia, Slovakia, Hong Kong, Taiwan, Macau, Singapore, Croatia, Estonia, Kuwait and South Korea. If you would like to buy from the USA TBags Los Angeles online store, simply let us know which items you would like to order (by filling out the form on the right). We’ll get back to you with a free international shipping quote within 24 hours!